Finely dice the onion and add it to pan with a drizzle of rapeseed oil, fry it off until soft and then mince the garlic and add that to the pan, allowing it to cook for a few minutes. Then add in the paprika, dried mixed herbs, garlic granules and onion granules, mix it together well and leave it to cook down for a further 3 minutes. In the meantime, grate the courgettes with a hand grater or in a food processor, then place a clean tea-towel in a bowl, tip the grated courgette out into the tea-towel, twist it up and squeeze it tightly to drain out the water from the courgettes into the bowl. This may take some time, but it's important to remove as much of the liquid as possible. Then, place the courgette in the pan and add in the nutritional yeast, flaxseed, plain flour and season well with salt and black pepper. Stir that through, then add in the fresh parsley and basil. Mix well again then set aside and leave to cool slightly. Pre-heat the oven to 180 degrees celsius, then taking 1 tablespoon of the courgette mix at a time, create 12 balls using the palms of your hands. Place those on a lined baking tray and pop them in the oven to bake for 20 minutes, in the meantime, make a basic Marinara sauce in the pan used to cook the courgette mixture, and cook the spaghetti. 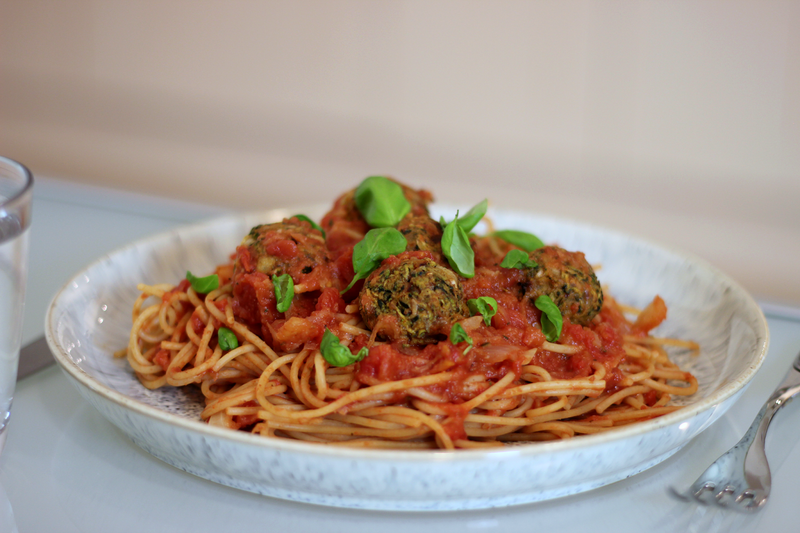 Remove the Courgette Meatballs from the oven, then drain off the spaghetti once cooked and add it to the Marinara sauce, mix it through then serve the spaghetti with the Courgette Balls and any remaining sauce on the top. Garnish with fresh basil. The Courgette Meatballs can be refrigerated in an airtight container and used within 2 days. Not suitable for freezing.